SYNOPSIS: Even though the poster art might imply that this forgotten Sc-Fi film is a Westworld rip-off…it isn't. This is more of an Avatar precursor. In the near future (1989!) unwitting subjects are dropped into an old west town simulation. It's a program by the government to find reliable military men. Keir Dullea is our hero who shows leadership qualities from the minute his journey begins. 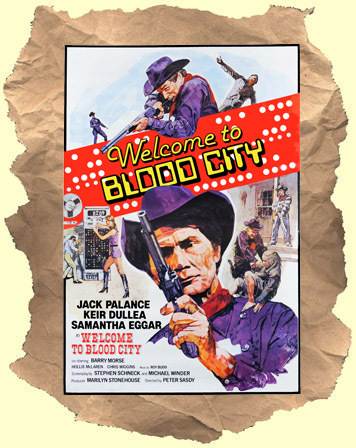 His biggest threat in the town of "Blood City" is no-nonsense sheriff Jack Palance who doesn't always play by the rules. Dullea usually played somewhat bland characters in his career so it's good to see him as a confident, cocky, hero. Palance chews lots of scenery as the grinning (conflicted) villain. Samantha Eggar is memorable as one of the scientists controlling the experiment. Her selfish emotions sometimes get in the way of her job. This film has the look and feel of a made-for-TV movie but a few last minute twists in the plot make it worth a viewing.